PDog Opinion….Was Mueller and Rosenstein so afraid that they ducked going after Donald Trump? During my walk this morning a couple of things dropped in my mind…. While Donald Trump and Republicans are doing a victory dance….. While Trump is tweeting and yelling to anyone in sight that there was no ‘collusion ‘…..
And the Democrats scratch their heads ….. I think something doesn’t add up…. Robert Mueller was sent on a mission to find out if there was any ‘collusion’ between the Russians and the Trump campaign , and to go after any crimes discovered along the way…. 34 people where charged with criminal behavior …..
Attorney General Barr reported to Congress and all of us that there was ‘No’ collusion…..
Trump and company ran with THAT….. But this dog and others are scratching their heads…. Turns out he wasn’t lying…. Trump fired people for NOT stopping investigations against HIM…. But any OTHER person with the evidence Mueller and Rosenstein had against them would be IN jail…. Let’s start with Donald Trump…..
Mueller and more Rosenstein had to be going to work everyday worried that Donald Trump fire them ….. Thus stopped ANY investigation and throwing the country into a political turmoil…. Added to this is something else…. Other lawyers have given those two an out against tangling with Trump…. Justice Department lawyers have a policy view that sitting President cannot be charged with a crime ….. This is an untested view…. There is NOI LAW against a sitting President being indicted…. Barr looks at the whole 2 years and says …..
Donald Trump’s campaign was had Russian ‘attempts’ in contact…. All the stuff that was reported about extensive contacts with Manafort , Corsi and others? One might get the impression that Mueller and Rosenstein do NOT want to go into the part early on that involved intelligence community ‘sources and methods’? There are a few reasons this conclusion is problematic…. Common sense seems to point to a few things…. Since Trump is not supposed to be charged criminally? Maybe Rosenstein and Mueller decided NOT to sacrifice the whole thing by going after Trump, since that would involve a long contentious legal fight…. Donald Trump’s technique of ‘going hard’ against anything in his way works again….. Even if he bends the rules that we others have to worry about…. And the new Attorney General seems to have followed his feelings all along…. That the probe was bogus in the first place…. The Office of the Presidency survives with arrests at it doors and occupant with dirty hands…. The Mueller throw down is generating even more questions then I have…. It appears that Barr was told about the report a week ago….. Notified that Mueller would NOT give a conclusion on the obstruction question…. Barr has walked that ahead…. Check the one week time line…. Barr was notified THREE WEEKS ago that Mueller would NOT pass judgement on an obstruction charge…. 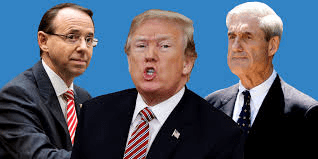 Mueller told Rosenstein and Barr that he HAD arguments AGAINST and FOR an obstruction charge…. There have been numerous lawyers on the TV that are challenging Mueller’s holding back on legal grounds….